You'll be £12.99 closer to your next £10.00 credit when you purchase Napoleonic Lives. What's this? Two hundred years ago the Revolutionary and Napoleonic Wars convulsed the whole of Europe. These were key events in the history of the continent, and for Britain, and they are a fascinating field for historical – and family history – research. More records than ever are available on the men who served in the British army during the wars – and on their families - and Carole Divall's new book is the perfect guide to how to locate and understand these sources - and get the most out of them. She gives a vivid insight into what soldiers' lives were like during the period and shows how much of their experience can be recovered from the records. Using the full range of sources - contemporary military records, correspondence, diaries, memoirs – she reconstructs in detail the stories of a representative group of individuals who took part in the wars - a soldier who saw action as a marine in the Mediterranean fleet, a Gordon Highlander who was taken prisoner, riflemen who served at Walcheren, in the Peninsula and at Waterloo, artillerymen who played a crucial role in battles and in sieges, a gentry family whose sons served as officers in the Peninsula and in India, and two remarkable women who were among the many who went to war with the men. Carole Divall's informative and accessible book will be essential reading and reference for anyone who wants to find out about the Revolutionary and Napoleonic Wars and is keen to understand the part an ancestor played in them. Very readable and compelling, an interesting presentation by the use of case studies rather than focussing on lists of where to research and what. A wide variety of areas are covered in this book, ranging from 'hard bargains' (those soldiers who were always breaking the rules), those serving as marines, to officers and even women's roles within the army. A timeline precedes the main text, which is very useful as an aide mémoire. Each chapter selects a specific subject and builds a case study using named individuals, concluding with a section on where to research the particular topics addressed. Each contains historical background information with copious dates and locations and sets the scene for the chapter subject. This makes the book extremely readable and interesting, and gathers all the nitty-gritty information of research into the various areas under discussion to a separate section at the end of each chapter making it easy to find, rather than punctuating the 'story'. The chapters, although greatly overlapping in events and dates, do appear to progress from the very stirrings of the rise of the Napoleonic era, to concluding with a chapter, where the main focus in time is at the end of the period, thus creating a natural progression to the work. The text is supported by many illustrations and battle maps. A useful addition to the publication would be a list of illustrations and maps at the beginning. There are a few endnotes to each chapter, although these vary from just three in one chapter to thirty-three in another. However, there is a lot of information in the 'Researching' section of each chapter. A short further reading section and fairly basic index complete the book. Overall, this book is well-edited - I found only one spelling mistake - and is presented on good quality materials. I found it very readable and compelling, being an interesting presentation by the use of case studies rather than focussing on lists of where to research what. A useful guide for anyone researching the military history of this period, providing an insight into the lives of those in the wars. 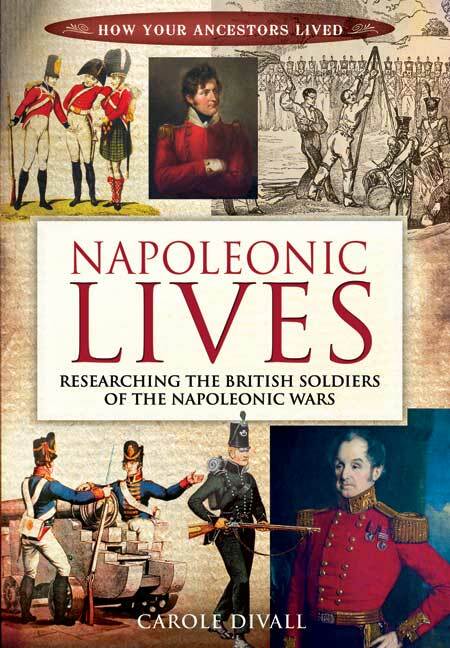 As an interesting read of potted biographies of a variety of soldiers, Napoleonic Lives is worth a look...this book is an important and significant contribution to genealogy. The Napoleonic Wars saw the British Army expand from 40,000 men at their start to more than 250,000 by 1813. Many genealogists will discover a soldier ancestor, and this handy and informative guide will reveal much about their life. Taking the lives of a range of soldiers, Divall uses a variety of sources to provide highly readable short biographies. Napoleonic Lives is an interesting book and one that ill please genealogists and military historians alike.